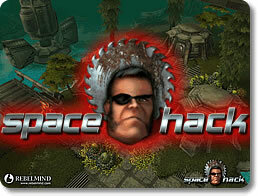 Space Hack Game Review - Download and Play Free Version! 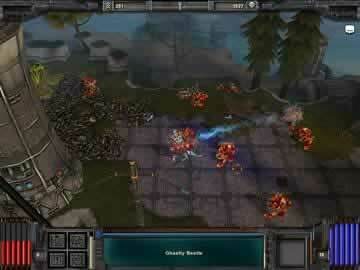 Blast Your Way Through Hordes of Aliens to Rescue Survivors in This Massive Sci-Fi Action RPG. The story puts you on a colony transport ship that suddenly gets trapped inside a Black Nebula, but that's only your first problem. While trapped, the ship is boarded by aliens that take over the ship and begin to kill and eat the colonists. You play as Hack, a tough, grizzled ex-military man as you struggle to reach an emergency transport module at the far end of the ship to free the remaining colonists, blasting and slashing your way through hordes of alien creatures along the way. One thing you will notice about Space Hack is that it is huge! There are over 45 different levels and dozens of weapons and hi-tech items to use against the aliens. There is an estimated 80-100 hours of game play in order to finish the game which is massive! The colonists need you. Be smart, be quick, and explore everything and you just might make it! Space Hack sticks with the classic hack-and-slash formula of most action RPGs and provides at least a decent action experience. 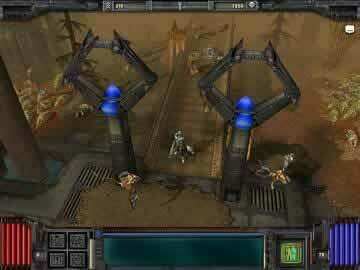 The action is very similar to the original Diablo with all actions being controlled with just a click of the left mouse button. It is also really easy to look around the 3-D environments since you can rotate the camera with just a spin of the mouse wheel. This all makes for a rather simple and easy to use interface that action RPG fans will be instantly familiar with. As you take Hack, the main character, on a one-man rescue operation to save your ship from hordes of aliens there are plenty of areas to explore and creatures to smash providing you hours of playtime, nearly 80-100, which is nice especially considering its low price. There are also plenty of weapons for you to choose from, ranging from a simple light bow or club to magnetic guns and ice rays. Then there are bio chips, which are similar to magical rings or necklaces in fantasy RPGs, which give boosts to your abilities or resistances. Gaining the ability to equip and use some of the more powerful weapons gives a huge incentive to keep playing and get Hack to higher and higher levels. Yet there are several issues which can detract from the addictiveness of this title. For starters, the story and dialogue unfold mostly through dialogue boxes and, besides Hack's grunt when he takes damage, there isn't much in the way of character voices which all adds up to a tale which is hard to get into or really care about. Also, the combat can get a little repetitive since you seem to just be fighting the same aliens over and over as you search through the ship. This is where probably the biggest problems arise in that the pacing of the game seems a bit awkward. You'll find many items that you just won't be able to use since it takes quite some time to level up and you only get 5 points to allocate between your different skills, which means it can take some time for you to have the 45 strength to swing that particularly good sword. Likewise, you can only really take on a few aliens at a time since the mix of some powerful long range aliens with other short range enemies can quickly overwhelm you if you aren't careful, which means your exploration will generally be rather slow paced as you draw out a few monsters from a group, run away for some breathing room, destroy them, and then repeat. Overall, Space Hack does provide plenty of hours of hack-and-slash action that fans of action RPGs can enjoy, but it has several faults which keep it from being a spectacular game. There are a ton of areas to explore and the weapon selection provides for many different strategies, but it would be best to try out the demo and get a taste of the action first to see if it is enough to keep your attention for hours of gameplay. Opening cinematic sequence of Space Hack.